I’d like to thank The Huffington Post for allowing me the privilege of being an occasional guest blogger. I am honored to have this opportunity. In this post titled Dogs on the Playing Field I discuss the role of professionally trained service dogs serving people with disabilites in the U.S. today and ask (and answer) this question: …even 23 years after the passage of the Americans with Disabilities Act and 70+ years since the introduction of guide dogs in the U.S. life in public isn’t always friendly. Lately it seems more unfriendly than at any time since the late 1930s when the blind had to fight for the right to enter a store or ride a public bus. What’s going on? I am grateful to The Huffington Post for allowing me the use of their platform to explore this issue. You would “make my day” by stopping by and sharing THIS POST with your social circles. Thank you! 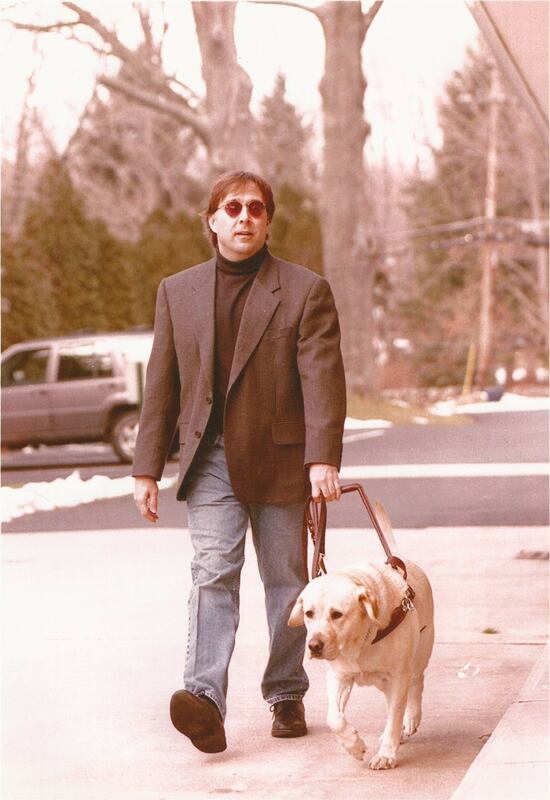 Photo: author Steve Kuusisto being guided by yellow Labrador, guide dog “Corky”, circa 1995. This entry was posted in "Disability" News, Current Affairs, Have Dog, Will Travel, What a Dog Can Do by skuusisto. Bookmark the permalink.